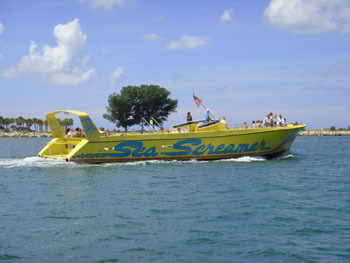 Join us aboard the Sea Screamer, the world's largest speedboat! With its dual twin-turbocharged diesel engines, the 72' long Sea Screamer gives you a thrill ride you'll never forget! At speeds up to 35 miles per hour on its deep-V hull, the Sea Screamer zips along the waters of the Gulf of Mexico in speed and comfort. Your comfort and safety are #1. The Sea Screamer is equipped with comfortable bucket seats, two restrooms, refreshments, and is Coast Guard licensed and equipped for your safety. No other tour boat puts a smile on the kids' faces like the Sea Screamer! Whether it be speeding up and down the beaches, enjoying the spray, or watching dolphins play in our wake, kids LOVE the Sea Screamer! Year after year, the Sea Screamer keeps them coming back for more! Clearwater's only speedboat dolphin adventure! Book Online Now! © 2019 Sea Screamer. All Rights Reserved. SEA SCREAMER, Clearwater Municipal Marina Slip #15, 25 Causeway Boulevard, Clearwater Beach, FL 33767 map & directions Group Rates & Reservations: Call 727-447-7200, Fax 727-449-9201. Email or Call for your THRILL RIDE Today! Notice: Schedule and routes vary depending on weather conditions and other considerations beyond our control. All Sea Screamer cruises and special promotions are subject to availability and changes. Restrictions apply.